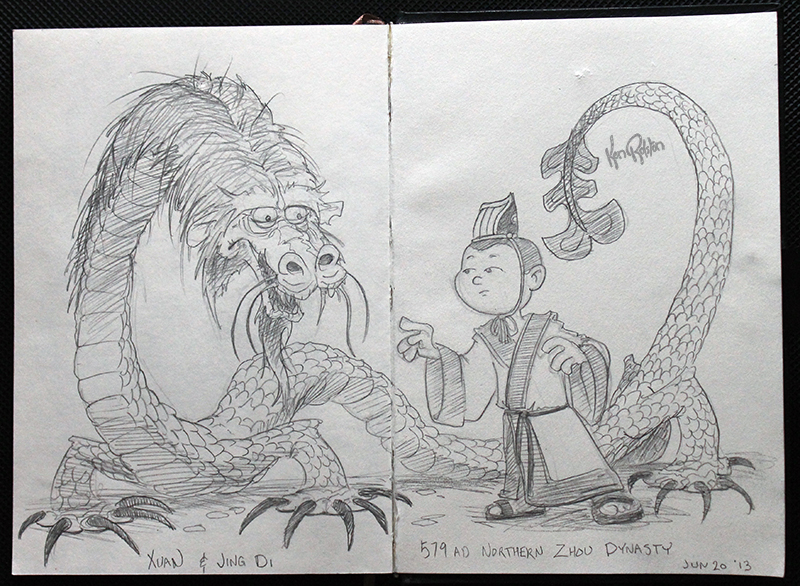 Dragon 560 – Xuan the old dragon imparts his wisdom on the young emperor. Ok, this is an interesting story. But first things first, I read today that there are nine different types of Chinese dragons. One of them is a yellow hornless dragon that represents the Emperor. Imagine this guy as being yellow. Back to the story that caught my eye today. In 579 AD, Emperor Xuan stepped down as Emperor, and his 6 year old son Jing Di was named as regent. Turns out this actually happened in the summer of 579 AD, in the fall of that same year Jing Di was married. Xuan passed away in 580 AD. Jing Di’s wife’s father, a general in the army stepped in to run the country until Jing Di was ready. Another general, thinking that his counterpart actually wanted to take over started a revolution. There was bloodshed. Unfortunately for Jing Di, he never grew into his role. His marriage and life were cut short in 781 AD. Another note. The Zhou dynasty collapsed in 250 BC, this is the Northern Zhou Dynasty, totally different collapse. And…there was also another Jing Di – the 5th Han Emperor who was buried with a terracotta army, though it is not as large as the more popularly known Qin army.